Proprietary Name: Conju Princess Cleansing Balm What is the Proprietary Name? Non-Proprietary Name: Mineral O Il What is the Non-Proprietary Name? 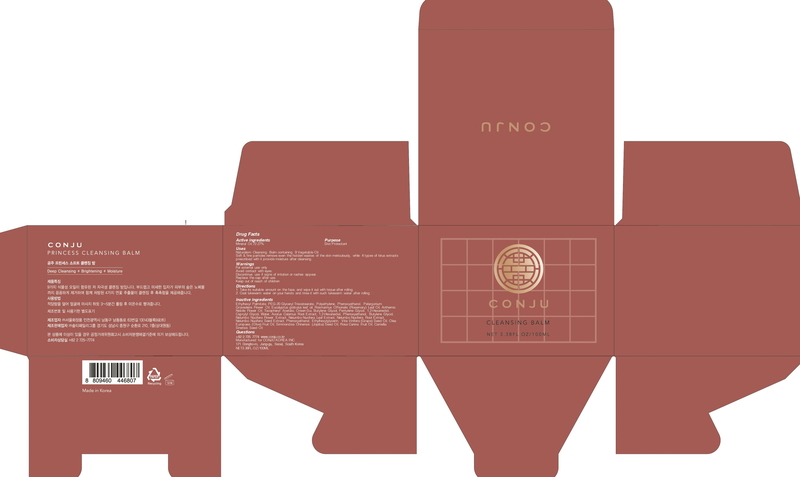 Conju Princess Cleansing Balm with NDC 72950-020 is a a human over the counter drug product labeled by Conju Korea Inc.. The generic name of Conju Princess Cleansing Balm is mineral o il. The product's dosage form is gel and is administered via topical form. Uses:Naturalism Cleansing Balm containing 9 Vegetable Oil.Soft & fine particles remove even the hidden wastes of the skin meticulously, while 4 types of lotus extracts prescribed with it provide moisture after cleansing. Directions:1. Take its suitable amount on the face, and wipe it out with tissue after rolling.2. Coat lukewarm water on your hands and rinse it with such lukewarm water after rolling.